For severe cases, injectable biologics such as IL-17 and IL-23 antibody inhibitors. Symptom improvement: 75 to 100 percent. Downsides: Increasing bodily resistance over time. High costs that are difficult to get reimbursed through insurance. Potentially life-threatening side effects. For moderate to severe cases, retinoids, methotrexate, and other oral medications. These suppress inflammation and skin cell production. Suitability: short-term. Possible side effects: hair loss, lip cracking and inflammation, upset stomach, fatigue, liver damage. For light to moderate cases, prescription steroid creams and ointments. Possible side effects from prolonged use: skin thinning, potentially resulting in stretch marks, spider veins, easy bruising and increased risk of injury. For light to moderate cases, sunlight/UVB therapy. Prolonged exposure can worsen symptoms. Skin aging from sunlight is amply understood. Light-sensitizing soralen (a medication) combined with UVA can help more severe psoriasis, but side effects can include nausea, headache, burning, and skin cancer. For light to moderate cases, over-the-counter creams and ointments. Includes coal tar and salicylic acid containing products. Many of the current products have limited effectiveness, require inconvenient frequent applications multiple times per day, and many formulations are smelly, greasy, and poorly absorbing. Other than the new biologics for severe psoriasis very little has changed in psoriasis treatments over the last 50 years. While the vast majority of psoriasis sufferers are unsatisfied with their treatment options, they have had little to no recourse. Equipped with degrees in biochemistry and business, Art Clapp spent over 20 years at Galderma, learning the pharma industry from sales and marketing through product and commercial development. He learned the techniques for developing the best prescription and cosmetic skin care dermatology products in the world. He could have retired quietly after Galderma, but Clapp wanted to help people and use his knowledge and expertise to help those who are suffering and deserve better treatment solutions. Art chose to focus on psoriasis first where there is a rampant need underserved by existing treatments. For mild to moderate psoriasis sufferers looking for topical treatment, Prosoria offers a superior, sustainable way to control symptoms without the common complaints that plague other options. “Prosoria delivers a more powerful approach needed when treating a tougher condition like psoriasis, but safely. Prosoria harnesses the effectiveness of combination therapy along with potent psoriasis fighting ingredients that relieve psoriasis symptoms and help control future flares. The system was carefully designed to treat specific symptoms and work synergistically. The secret is the system. The power is in the combination,” Clapp said. Advanced skin conditioners and humectants help hydrate and balance the skin’s natural environment, preparing it for further treatment. A powerful psoriasis fighting treatment gel that penetrates into your skin quickly. The uniquely designed formula helps relieve redness, scaling, flaking, itching and irritation of psoriasis and helps maintain clearer skin with daily use. Combination of exfoliating and moisturizing agents that helps restore skin texture and appearance. Gently exfoliates and sloughs off dead skin cells leaving the skin feeling smoother, hydrated, and moisturized. An intensive nighttime skin treatment that boosts and accelerates exfoliation to rapidly restore the skin’s appearance while intensively moisturizing. It’s soothing and calming to the skin. The products are clinically proven and dermatologist tested. Additionally, Prosoria has earned the seal of recognition from the National Psoriasis Foundation (NPF). After weeks of careful review by medical experts, this seal is only awarded to companies whose O-T-C products are proven to safely and effectively relieve the symptoms of psoriasis. The Seal of Recognition identifies tested and trusted products that help people ease symptoms of dry, itchy, flaky skin. “We identified above what most people don’t like about conventional psoriasis treatments. 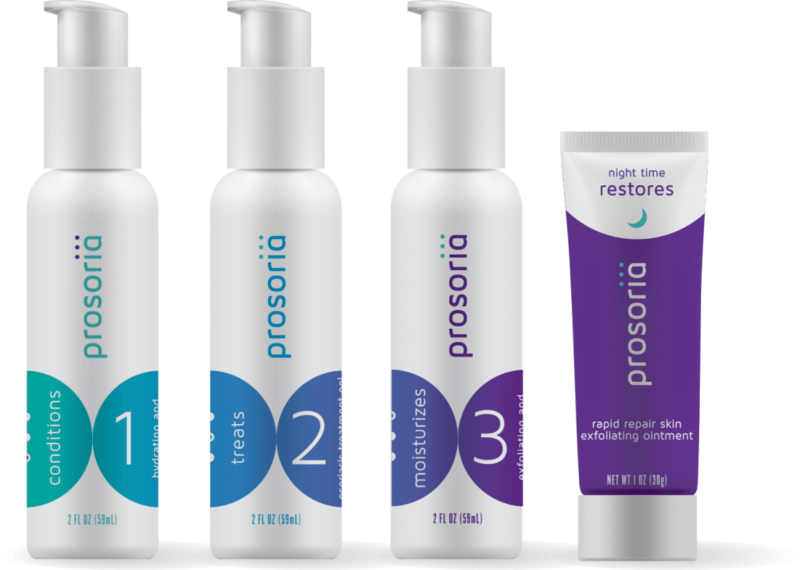 Prosoria remedies each of these concerns in a novel approach that really works, while emphasizing safety, convenience, and even beauty,” said Bev Hope, director of marketing. “After six to seven months [of trying many treatments to treat my psoriasis], I actually threw my hands up and said, ‘I give up, because nothing is working here.’ It would just stay the same or sometimes even get worse. But I found [Prosoria] extremely easy to use, and I got great results shortly thereafter. It took some time, but it worked,” said Gloria, a Prosoria customer. “I had about 25% coverage, mainly on my legs, my knees, and my elbows. [My dermatologist] put me on an ingested medicine that gave me really bad side effects. I had chest pains and all sorts of different things. I’d try psoriasis cream, coal cream – smelly, horrible stuff. And it just didn’t work. An injection medicine … was helping slightly, but I started getting symptoms of flu. … I’ve been using [Prosoria] for a short time, and I would say I’m now about 2% covered. So, with a little bit more time, I feel I’ll be 100 percent free,” said Karl, a Prosoria customer. Karl’s elbow before and after. With Art Clapp’s background in anti-aging, acne products and moisturizers, he knew how important it was for Prosoria to feel great on the skin while doing its job. Unlike with many other treatments, Prosoria users report wanting to apply their medicine each day for its smooth, creamy texture and lasting sense of comfort. This helps motivate them to be consistent in their daily applications, which in turn promotes desired results. Nuvothera’s products incorporate natural botanical ingredients and use the latest in scientific knowledge and evidence-based research. Currently, the company has two products in its portfolio: Prosoria Daily Psoriasis Treatment System available via the company website and on Amazon, and Nuvothera Super-Micronized Turmeric Curcumin, coming soon.